Houses & Homes VA: The Baltimore Riots - Protestor OR Criminal? 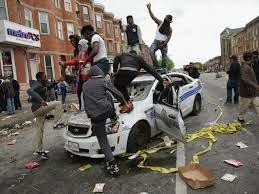 The Baltimore Riots - Protestor OR Criminal? It all began on April 19th. That was the day that Freddie Gray died. Police had chased and restrained the 25 year old black man at Gilmor Homes one week earlier. He appeared to be limp and was screaming in pain as officers placed him into a police van and all of this was recorded on the cell phone of a witness to the event. After arriving at the police station medics immediately rushed him to the hospital but tragically, he slipped into a coma and died 1 week later. His family stated that 80% of his spinal cord had been severed and that his larynx had been crushed as well. In a statement following his death the Baltimore Police admitted that he should have been taken to the hospital immediately instead of the police station but judging from the extent of his injuries this may not have made a difference. The point is, however, that it might have made a difference and many people are very upset about the entire situation. Upset enough to riot in the streets of the city. The situation in the city is tense and many people are frightened. We live in a democracy, a free republic and we have both the right and the responsibility to protest when we feel that any level of our government has done something that we do not agree with. Demonstrations are legal and a necessary part of any democracy. It is the people’s way to express in no uncertain terms how they feel about a particular situation and what they want to be changed. “Of the people, by the people and for the people”, remember? I don’t recall reading the words “against the people” in any of my school books. I believe in the right to protest but I do not agree with the violence. This is where I become confused. Lighting businesses on fire is NOT a legitimate form of protest, it is a CRIME. Burning cars, looting local area businesses, attacking and injuring police officers that had nothing to do with the arrest of Freddie Gray? Is this what some people refer to as a “protest”? How can anyone feel that more violence is the right way to handle any situation? And when is the last time that we’ve seen positive change at any level of our government as a result of such violent and destructive activities? You will certainly see a response from the government to the rioting and looting that is now taking place but are armed National Guardsmen patrolling the public streets of a major city the change that the so called “protestors” are hoping for? There is a major difference between a peaceful demonstration and an all out riot. An effectively planned demonstration is designed to bring attention and support from other citizens in the hopes of changing whatever it is about the government that you do not agree with. A riot on the other hand is a form of violence and destruction and as far as I concerned is nothing more than an excuse to break the law that is hiding behind whatever issue has caused the problem in the first place. Genuine demonstrators are law abiding citizens who are genuinely concerned about their community and the other people that live in it. The true demonstrators in Baltimore are very upset about the death of Freddie gray and rightly so. They want answers as to how this young man received such horrific injuries apparently as a result of his scuffle with the police on April 12th and why he didn’t receive medical treatment immediately. I also want the truth but we must keep in mind that violence and mayhem are the acts of criminals, not protestors and that diligence, perseverance and consistency will get to the truth in this situation, not continued crimes against others that had nothing to do with the original situation. Yes, let us not confuse criminals with protestors because the protestors deserve to be treated with much more respect than that.